This blazer has been in my closet for 8 years and my love for it has never faltered. It was my first designer buy and it's longevity proves I made the right choice all those years ago! I wore this for a quick trip to NYC last week to see a friend I haven't seen since our trip to London 2 years ago! After that I headed to New Jersey for dinner at a friends house. I can already tell that these boots my mom bought at Marshalls for my birthday are going to be getting a LOT of wear this Fall/Winter! They are classic, basic and super comfortable! I walked through NYC and an outlet mall in Jersey in them with no pain. And these Mother Denim jeans are more like sweatpants because they're so soft! I'm not even sure if I should consider them jeans, but I do. This is such a cute look! 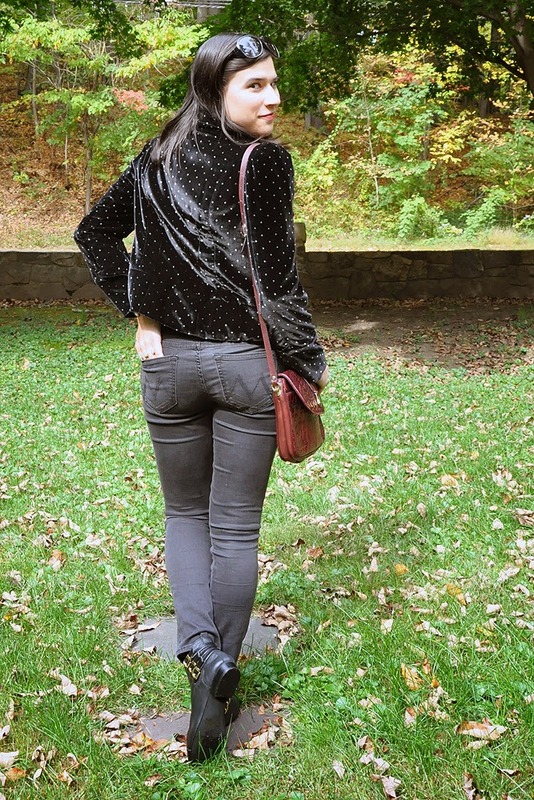 LOVE those jeans on you, and your booties are super-cute! I'me sure I've told you before how much I love that blazer but it's definitely worth saying again. That piece is awesome! I've always liked that jacket - its something you can wear with jeans and to a gala event. I love your cute blazer! Polka-dots will always be fashionable! You gotta love those pieces that stick around forever! ps. I'm trying to up my bloglovin game - help a girl out? I love this whole outfit on you! I'm also a big fan of Mother Jeans, the fit and comfort is amazing, I wished I owned more besides my one pair. Sounds like you had such a fun day! Glad to hear the booties were a great buy. I am on the hunt for a new black pair this year, last years are a bit worse for wear (altercation with a brick porch). I love that you are still wearing that blazer after so many years. I think my oldest thing is probably less than 5 years old! Great blazer! I love when an item just works so well and you can wear it forever! Great blazer! Such a staple on the wardrobe. Gorgeous blazer and I love how you styled it. Wishing you a happy weekend! That jacket is too cool! Love it! Such a gorgeous blazer. Designer buys last longer, mine because I barely touch them hihi. I'm not surprised to hear that this blazer is a long-time favorite. It looks brilliant. I love those items that one can wear again, and again....and again; ones that wait, like familiar friends to go out and about again. Oh my goodness, I want it all! Love the monochromatic look with the pop of color with your bag! I need that ring and the bag!